Comedians are like bullfighters: The best work dangerously close to the horns. Some, like Lenny Bruce and Freddie Prinze, make a fatal misstep. Others, like Richard Pryor, come frighteningly close. 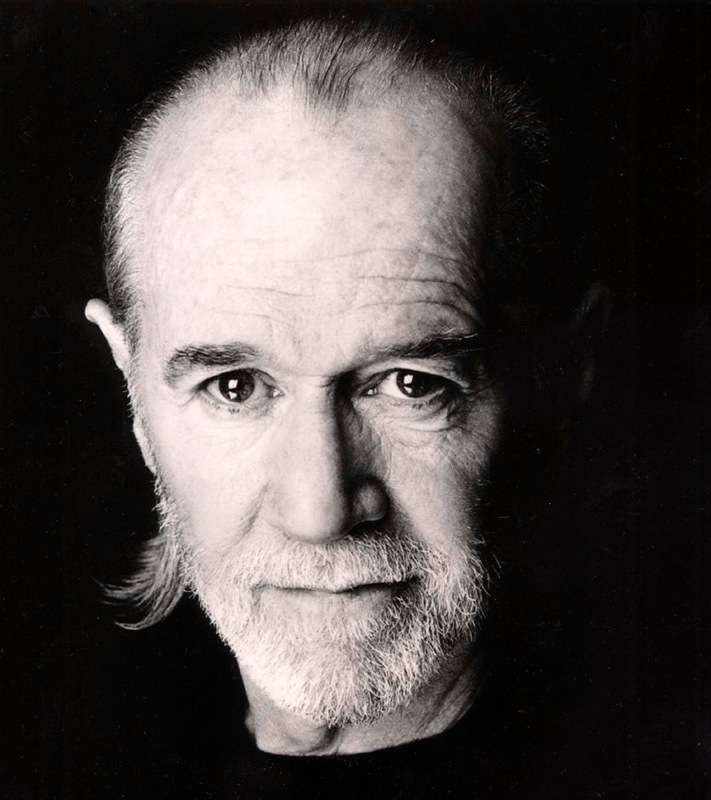 When his moment of truth came, George Carlin was at the peak of his career. In the early '70s he was the hottest comedian in the country, a whacked-out hippie whose LPs routinely went gold. His corrosive send-ups of Middle America convulsed audiences on the Tonight show (where he subbed frequently for Johnny), and he booked 100 concert dates a year. Meanwhile the offstage Carlin was self-destructing. He had "a 24-hour-a-day pot habit" and was blowing a fortune in cocaine every week. He and his wife, Brenda, felt their lives—and their relationship with their daughter, Kelly—strain under the twin pressures of his drug habit and her problem with drugs and drinking. "It was a lot of things: career highs, new recognition, money, coke and pressures at home," Carlin says. "It was hard to watch Brenda, but I'm sure it was hard for her to watch me." In A Place for My Stuff—his first album of new material in nearly five years—Carlin takes aim at a familiar target: the little absurdities of everyday life. He still uses dirty words—though scatology once got him banned from a Las Vegas lounge and embroiled a New York radio station in a five-year court battle with the FCC for broadcasting Carlin's notorious "Seven Words You Can Never Say on Television" routine. He is outrageous, as in a mock interview in which he plays Jesus answering questions about Lazarus ("He wasn't dead; he was hung over"), the Apostles ("A good bunch of guys; they smelled a little like bait") and Hell ("There's also a heck; it's not as severe"). Then there's his "Book Club," featuring titles such as How to Filet a Panda, How to Turn Unbearable Pain Into Extra Income and Cooking With Heat. The routine has fewer jokes about drugs now. "I do drug humor occasionally," he says. "But it isn't obligatory, as before." Drug jokes—and drugs themselves—became Carlin's crutch about 10 years ago. By 1973, he says, he was smoking joints before breakfast, drinking 20 beers a day and sharing a heavy cocaine habit with Brenda—a freelance talent coordinator for Hollywood production companies. They tried to escape drug-fueled bickering on a Hawaiian vacation in 1975, but, as Carlin remembers, "The horror followed us there." After a week of violent scenes, Kelly, then 11, made both her parents sign a contract with her, agreeing to forgo cocaine for the rest of the trip. "It took a long time for the message to sink in," Carlin recalls now. "Drugs only made things more frantic-sounding and shrill." The message sank in earlier for Brenda than for George, and she embarked on a successful drug-and-alcohol withdrawal program. George followed her lead. At first he was afraid he needed drugs to work; soon he realized that "there are no jokes in a vial." Still, convinced that his new material was stale, Carlin stopped making albums when he stopped abusing drugs. "I needed a breathing spell," he admits. "I knew it was time to gather strength. I had to get over drugs. I had to get well physically and stop this outpouring of material every 12 months." Just as Carlin was turning the corner mentally, his body betrayed him. In 1978 he suffered a heart attack. "My brain was saying, 'This guy has been operating on drugs for a long time,' " he believes. " 'He's finished with that now, and he's trying this other kind of life, but let's send him a little signal that he ought to be thinking about exercise, diet and stress control at his age.' " Carlin switched to a health food diet and a regimen of exercise—only to have another harrowing brush with death last summer when he nearly went through the windshield of his rented Volvo on a rain-swept road in Ohio. His face still bears the scars of the accident, but he is glad to be alive. "I've been very lucky about the big things," Carlin concludes. Luck was hardly George's birthright. Born in 1937, he was a wiry Irish Catholic kid from a tough New York neighborhood near Columbia University that he now refers to as "white Harlem." His parents separated when Carlin was 2 months old; his mother, Mary, took the two children in "a dramatic escape over some 112th Street rooftops." His father, a hard-drinking newspaper advertising salesman and "a bit of a bully," died when Carlin was 8. George's mother worked as an executive secretary for an advertising trade organization to support him and his older brother. Now 85, she lives in Santa Monica. "We have a pleasant relationship," says George. "She doesn't like me making fun of God or big business, which she loves. She had trouble at first with my language until a nun told her it was all for a good purpose." A natural cutup, Carlin says, "I wanted an audience from the time I was 6 years old. I was a mimic: I'd imitate teachers; I'd imitate priests. It was great to disrupt things," he continues. "Here's 30 people trying to get an education, and I'm over there with my hands underneath my armpits blowing out artificial farts, and I'm getting all the attention." Not too surprisingly, he was kicked out of a lot of places—schools, the Boy Scouts, choir. "I just never took to authority," he says. At 16, George quit school and later joined the Air Force, where he was court-martialed twice, first for cursing an officer, then for sleeping on guard duty during war games. He had joined up so he could go to a school for disc jockeys on the GI Bill. But while he was still in the Air Force, Carlin managed to get a job at a radio station near the base. By the time he was discharged, he had perfected the unctuous radio announcer's voice he still uses in many of his spoofs. Two years later, in 1960, Carlin teamed up with radio deejay Jack Burns to become a successful comedy team that played nightclubs in New York, had a short-lived radio show in Hollywood and toured the East. The partnership lasted until 1962, when Carlin decided to go solo, and Burns went on to 1960s TV fame with his new partner, Avery Schreiber. In 1960 Carlin also teamed up with Brenda, then a hostess at a nightclub in Dayton, Ohio where he was performing. "It was a very fast fall-in-love," George recalls. Within a year they married. In the durability of that 20-year marriage, Carlin says he has found the strength to endure the worst periods of drug addiction. "We just always knew, even during those times, that our marriage was first." George pursued his dream of a TV sitcom of his own through guest spots on 1960s shows like Merv Griffin and The Kraft Music Hall. Suddenly, in 1970, with the help, he admits, "of some acid and/or mescaline," he grew tired of making "mother-in-law/crab-grass jokes for drunken conventioneers and sailors" in nightclubs. He got up on the stage of the Frontier Hotel in Las Vegas and, using unprintable words from his "white Harlem" background, railed against business, the Vietnam War and the audience itself. (Outraged members of the audience reportedly had to be restrained from attacking Carlin.) He was fired. "That's when I knew that things I felt inside me were better than trying to do something that wasn't me," he says. Carlin went back to the coffeehouses and the campuses where he had begun, exchanging his tuxedo for a tie-dyed T-shirt and dungarees, taking and talking about drugs, growing a beard and long hair, which he often put into a ponytail—in short, turning hip. "I was never a radical," he says. "I was a comedian looking for an audience." His timing was perfect. Hip became big box office, and so did Carlin. His first record in his new style, FM & AM, released in 1972, went gold (more than 500,000 copies sold). So did his second, Class Clown. In 1975, after a steady cavalcade of hit records and sold-out concerts, he was invited to be the first guest host of Saturday Night Live, and his appearance did what the producers had hoped: It outraged people. "God can't be perfect," Carlin said on the show. "Everything He makes dies." Two years later he returned to Vegas, this time with no restrictions on language or content. Carlin has made his point: He is a big enough star that any nightclub in the country that wants him must take him on his own terms. But now, he says, performing has started to lose its attraction. He spends as much time as he can with his family in L.A. He daydreams of working at a desk, not on a stage. He has started a book of humor and is developing ideas for cable TV shows. "I look forward to the time when I only perform at the typewriter," he says. "I don't want to be a gray-haired stand-up comic."